If you’re really into the classic Fender Jazz Bass sound and worship bassists like Jaco Pastorius, Marcus Miller and Sting, then the PULSE from Le Fay is the ideal instrument for you. Le Fay has managed to teleport the inimitable sound of the Fender Jazz Bass into the present with state-of-the-art technology: three single coils and six-way switch or two single coils and two volume adjustors offer you additional means to optimize the sound to your wishes. This e-bass has Le Fay’s typical playability, which you will simply love. Your fingers will fly across the finger board, so to speak. Take a look at what Anton does with the PULSE 4. Just like all top-notch Le Fay basses, your PULSE e-bass is made of the finest materials. Reiner and Meik are totally uncompromising in that respect. The body of the PULSE consists of hardwood ash, which has excellent properties. The neck with a scale of 86,4 cm (34 inches) is made of padouk, has the usual Le Fay-own carbon-inside technology, and is bolted onto the body. The finger board of the PULSE, with either 22 or 24 frets, is likewise made of padouk and the serial production comes with Ley Fay’s “Standard” fret work. 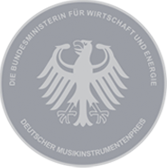 With the e-bass you can see above, we won the German Musical Instrument Award in 2017, and we are mighty proud of that. "Man, I love this bass! When this thing came into my life, my search was over with. Everybody is trying to make a five-string bass sound like a classic Fender bass. And when I heard this bass on YouTube when somebody else was playing it, I listened to it, I said: ‘Damn, man, that sounds like a classic Fender Jazz Bass.’ I´ve been looking for a five-string to sound like a classic four-string to be as powerful, and PULSE did. Man, it just makes me wanna play! You know, I love this thing. You can´t beat it. Thank you, Pee Wee, we couldn’t have said it any nicer. The PULSE is available as a four-string and as a five-string. In the standard version, the four-string comes only with two humbuckers, Le Fay PIPE and B BOW. The technical details of the instrument include a list of optional extras. Wood types, colours and cool block inlays. Take a look at the many different options. You want a special feature for your dream bass? Then get in touch. We’re always keen to hear your ideas.